Have a road trip coming up? 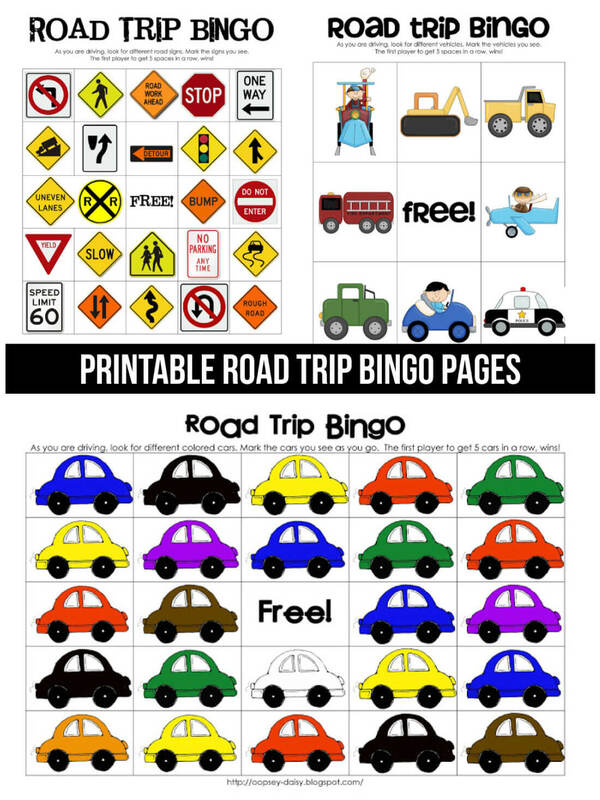 Use these cute Road Trip BINGO printables for your kids to make the trip a little more fun! This post was originally shared by Alison of Oopsey Dasiy Blog for my Funner in the Summer series. Living in the car for 2 days might have been painful. Luckily, the homemade root beer, family baseball games, and toasty camp fires made it all worthwhile. My Mom was a genius! She kept us entertained with prizes to unwrap, vacation journals to write in, and (my favorite!) games to play. Our favorite game to play was Road Trip Bingo! My siblings and I searched for windmills, license plates, birds on phone wires, etc. Sibling rivalry at its best! I am now a Mom, and I am already terrified of taking road trips. 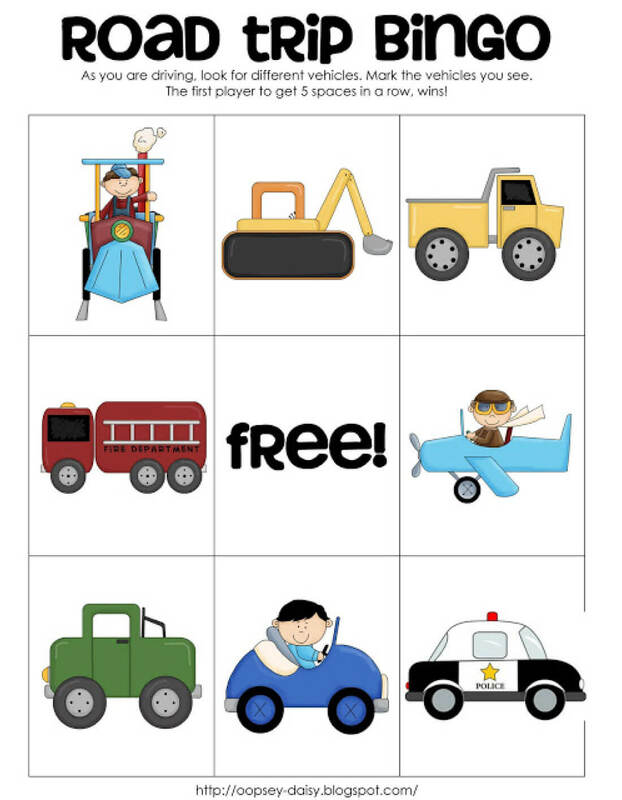 In anticipation of that ominous question, “Are we there yet?”, I created a few printables to help entertain our kiddos for those long summer road trips! 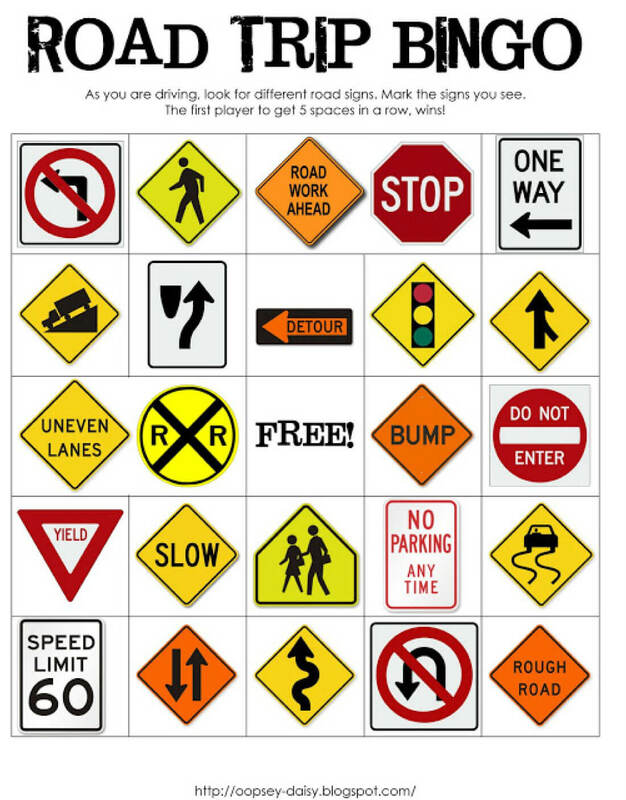 Each Road Trip Bingo game has 5 unique gameboards. Just print on cardstock, laminate if desired, and bring the game boards along on your next road trip! This version of Road Trip Bingo is ideal for older kids. They can search for different road signs as you’re driving. You can download this game here. Clip art for this Bingo comes from Scrappin Doodles. This game is ideal for younger kids with shorter attention spans. Search for diggers, trucks, cars, trains, fire trucks, airplanes, jeeps, and police cars. You can download this game here. Clip art for this Bingo comes from DJ Inkers. Used with permission. In this version of the game, kids can search for different colored cars. 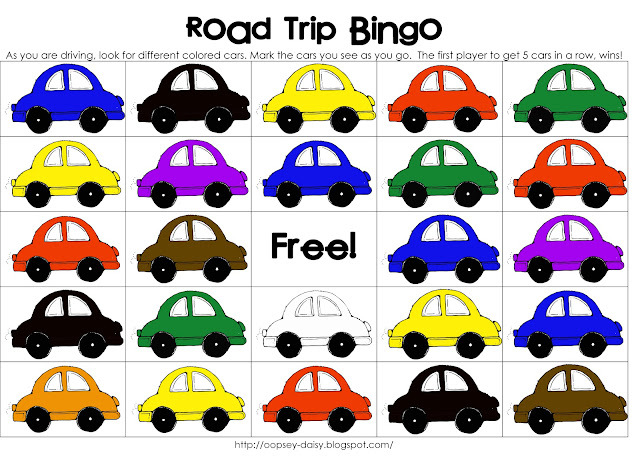 You can download the Road Trip Bingo for colored cars here. Thank you for great information I was in search of thijs information for my mission. Hi, all is going nicely here and ofcourse every one is sharing facts, that’s truly good, keep up writing. additionally sharing in delicious. And obviously, thanks to your sweat! I’m looking to start my own blog soon but I’m having a difficult time makingg a decision between BlogEngine/Wordpress/B2evolution and Drupal. The reason I ask is because your design seems different then mostt blogs andd I’m looking for something completely unique. normal issues, The website style is ideal, the articles is in reality great : D.
I love the road trip bingo. Your printables are really cool. Heading to Recipes now. You rock the printer! The color car bingo link is not working. Is there another way I can get the bingo cards? Thanks! I’m going to figure a way to put these on a metal sheet and then use magnets for markers! We will be driving from CA to NJ and back this June — these will break up some of the long driving days! Thanks! Thank you, Thank you, thank you!! I have a 3,4 and 11 year old, the little ones can’t read yet so any other car bingo I have found doesn’t work for them. These are perfect!!! These are awesome! Thank you so much. When I was younger my Mom had game boards for Auto Bingo. 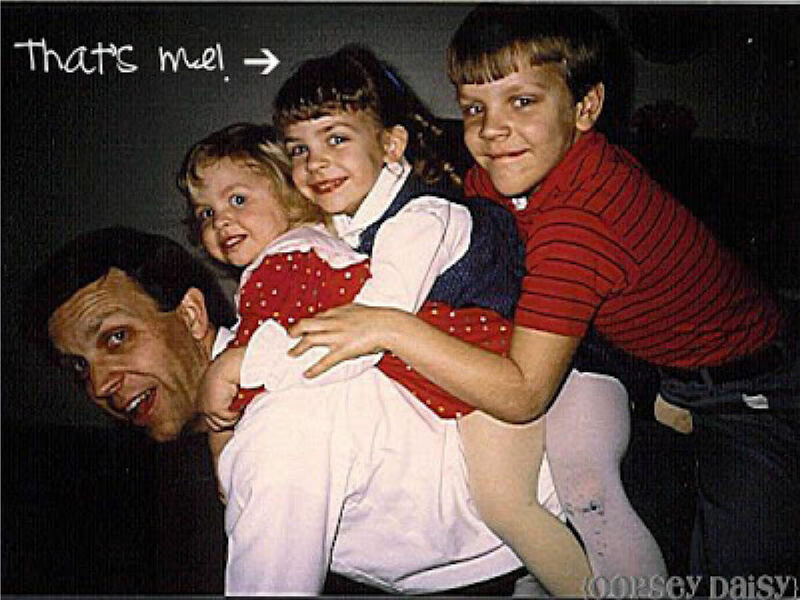 They were so much fun and were a very thick cardboard with pictures inside a window. When you saw whatever it was in the window there was a small slider piece of colored film you pushed aside to cover that window showing you’d found that item. I am pretty sure I still have those somewhere around here because when my Mom died and I had to clean her things out of the house I do remember taking those. Of course, they are packed away in one of the boxes and I really should find those now that I have a Granddaughter. She’d probably love the game. This is such a great idea, the kids would love Road Trip Bingo and it will certainly keep them busy. Thanks! This is awesome Alison!! I will be printing these off this summer for sure :) You’re the best! What a great idea. =) Love the printables. Hi Sally! If you look in the left-hand corner, there is a “file” link. In the dropdown menu, you’ll seen an option to either print or download. I’m not sure how to download the bingo files. I clicked on the download here link and it takes me to google docs. How do I download from there? Mique, thanks SO much for having me today!! When I post this afternoon, I’ll send my readers your way! You’re the best, my friend!